Do you struggle with maintaining a healthy weight? Are you frustrated because it is too painful to exercise? Do you have arthritis, fibromyalgia, or have you undergone surgery to your spine or lower extremities? Do you find it difficult to exercise and stay in shape over the winter months? If you answered yes to any of these questions, the answer may be as near as your local swimming pool. Discover the many benefits of exercising in a warm water pool, and learn more about the many different uses of aquatic therapy. Water is an extremely useful tool in rehabilitation due to its unique buoyant and resistive properties. The warmth and compressive forces of the water also provides additional benefits that greatly improve the overall rehabilitation experience. On land we experience the downward force of gravity and body weight. However, in the water we experience an opposite upward force. This force is is called buoyancy, and it allows an object to float. Because of the effects of buoyancy it is easier to function with a painful leg or back as less stress is applied to the joints. With walking on land forces are exerted through our lower extremities and back. These forces are 1-3 times our body weight when we walk and 3-15 times our body weight when we run. For example, an individual who weighs 150 pounds will actually be exerting up to 1500 pounds of forces through his or her lower extremity joints when running! This is a significant amount of force that is exerted through the bones and tendons. In the water, however, the full weight of a person’s body is not exerted on the lower extremities and spine because of the principle of buoyancy. The amount of force exerted on the lower extremities in relation to a person’s body weight depends mainly on the depth of water in which he/she is standing in. The buoyancy and upward force on the body is relative to the amount of water that is surrounding the body. The depths and corresponding forces through the body are as follows: water at waist level = 50% of your body weight, chest level = 75% of body weight, and neck level = 90% of body weight. Therefore, deeper water will result in less impact forces on the joints during exercise. This is the main reason why it is generally easier to walk and exercise in the pool on a joint that has arthritis. Individuals with back and spinal problems also have a tendency to respond well to aquatic therapy as there are less compressive forces placed on the structures of the spine in the water. With less forces it may be possible achieve more range of motion from the spine. Another benefit of aquatic therapy are the resistive forces which can be applied to the body for strengthening in the water. Viscosity is the property of fluid that causes it to resist flowing. This viscous quality of water allows it to be used effectively as a resistive medium. This means that your body must push against the resistance of the water in order to move through the water. This essentially is similar to lifting dumbbell weights (through air) on land. Since water is more viscous than air, water provides the resistance, whereas the dumbbell provides the resistance when on land. Therefore, when an individual is moving through the water, he/she is not only exerting less stress on his/her joints and body, but also strengthening his/her muscles. Speed is also an important factor which determines the amount of strength required to move through water. The faster a person moves a body part in the water, the more resistance he/she will produce against that body part. Besides the musculoskeletal system getting a work out, the heart and cardiovascular system are also stressed as well. 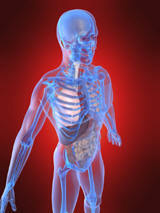 This occurs because the heart and lungs must work harder as the muscles of the body are challenged more in the water. Just as on land, if a target heart rate is achieved, the human body will burn more fat, build more lean muscle mass, and strengthen the cardiovascular system. This leads to improvements in overall health. For example, in order to decrease the amount of cumulative stress placed on the legs and feet, marathon runners often train in a pool. This decreases the risks of injury due to overtraining and cumulative repetitive stress, while strengthening an individuals' muscles, heart and lungs. For individuals that are experiencing swelling in their lower extremities, exercising in the pool can be quite beneficial. According to Pascal‘s Law (Blaise Pascal is a famous French mathematician), the pressure of a fluid is exerted on an object equally at a given depth. The pressure exerted by the water at a specific depth is known as the hydrostatic pressure. This pressure increases with the density of the fluid and with its depth. Therefore, hydrostatic pressure is greatest at the bottom of the pool because of the weight of the water overhead. This means in a pool, when your legs are immersed in the water, a compressive force is placed all around your legs. This would simulate wrapping a tourniquet or ACE bandage around your leg on land. Thus, if there is swelling (edema) in a lower extremity, or joint effusion (swelling within a joint) in the leg, placing the leg in water will help to reduce/control the swelling. Warm water pools often provide an additional benefit for those individuals with degenerative joint disease, chronic pain, soft tissue tightness, and impairments after surgery. The warmth of the water often feels soothing and relaxing to the muscles and bones. When your muscles and joints feel warm, they loosen up better and can move more freely and with less pain. This is why therapists always suggest “warming up” on land before beginning any exercise. It increases blood flow to the body’s muscles, heart and lungs. A proper warm up prepares the body for the upcoming exercise stresses. Therefore, warm water helps those individuals who have painful and stiff body parts to tolerate exercise with greater ease. Aquatic therapy is also an excellent tool for weight control or weight loss. Exercising in the water places less stresses on the joints and will most likely increase an individual's tolerance to exercise. The warmth and properties of the water are also therapeutic and will provide resistance to the muscles and cardiovascular system. If an individual is able to exercise more, he/she will be more successful in losing weight. Therefore, if land-based exercise doesn’t appear to be working, aquatic exercises may provide better results. Aquatic therapy may not be right for everyone. There are certain contraindications and precautions that must be considered before starting an individual on an aquatic therapy regime. A thorough evaluation must be performed by the Physical Therapist prior to starting any type of exercise. The Physical Therapist must also consider the physical properties of the water and the physiologic effects of immersion on the body in determining the appropriateness of aquatic therapy for the patient. Individuals with excessive fear of water, open wounds, active infections, incontinence, tracheostomy, or rashes are not appropriate for aquatic therapy. In some cases, physicians may allow their patients with open wounds to participate in aquatic therapy. 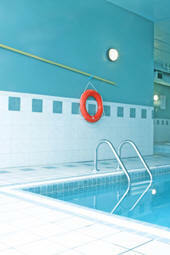 Prior to participating in aquatic therapy, a special waterproof type of dressing must be applied to the wound. This is commonly seen in patients with post-surgical incisions. Precautions to aquatic therapy include: cardiac history, pulmonary impairments, and Closter phobia or uneasiness in the water. It is also very important to educate an individual prior to starting an aquatic exercise routine. Just because an individual may feel less pain and increased mobility in the water, he/she must be careful not to overexert him/herself. Water provides support of buoyancy, a reduced gravity environment, muscular relaxation from the immersion, hydrostatic pressure and warm temperature. Due to these properties, an individual in the water may over exercise, as compared to being on land. Therefore, educating the patient on signs and symptoms of overexertion are a key part of patient education. Aquatic exercise is a wonderful adjunct to any exercise routine for those with certain health problems and for those who are healthy and looking for an alternative to the boring treadmill or elliptical machine. If you would like to learn more about aquatic therapy and the types of exercises that can be done in the water, please consult with a Physical Therapist. Copyright Â© 2005-2018 CyberPT Inc. All rights reserved.